Let's Party Like It's The End of the World! Will the world end on December 21st, or is it all much ado about nothing? Either way, no sense not enjoying yourself, and New Orleans has some entertaining ways to to spend your last evening on Earth. WHEN: Friday, December 21 2012 – End of the World Dinner from 5 to 11 p.m.
After dinner party likes it’s the apocalypse with some crazy parties around town! Cosmic Convergence Festival is an all day affair, taking place at the Sugar Mill (1021 Convention Center Blvd.). Giorgio A. Tsoukalos, Star of The History Channel’s Ancient Aliens hosts the apocalypse prevention festival along with The Intergalactic Krewe of Chewbacchus. The party will feature DJ’s and a long list of musicians including the Hot 8 Brass Band, electronic psy-rockers Ghostland Observatory, Alex McMurry and the Interstellar All-Stars, Quintron and Miss Pussycat, Rotary Downs, James Singleton and Sun Domingo. The End and the Beginning at Michalopoulos Studio. Celebrate the end of the Mayan calendar with entertainment from Helen Gillet, Generationals (DJ set), DJ Tony Skratchere. Take some photos in the booth, dress up in your best end of the world outfit for the costume contest, and be sure to catch a very special performance by Holly Tamale. WHEN: Friday, December 21 2012 from 6:30 p.m. to 2:00 a.m. The Galactic Alignment Party will take over the 8300 block of Oak Street at 7:30 pm for a free party on the street with food, music, and a special appearance by the avatar of Mayan god Bolon Yotke’ K’uh (an only in New Orleans moment I’m sure). A ticket into the event keeps the party going party at 10:00 pm in the Maple Leaf Bar with a Dance Party and music by Stanton Moore, Ben Ellman, Jeff Raines, Rob Mercurio, and Rich Vogel. Online sales are out, but stop by the bar to see if you can still score some tix. Dance Party is $45 – Bar should open at 3:00 pm today there may still be some tix. Happy Thursday w/Non-Stop Holiday Events - Christmas Is On! Enjoy the sounds of the season at the Cathedral-Basilica of St. Louis in Jackson Square. Produced by French Quarter Festivals, Inc., the St. Louis Cathedral Concerts feature a variety of New Orleans artists including well-known jazz, classical, and gospel musicians. Beloved holiday classics and gospel favorites will be performed in one of the country's most beautiful and historic churches. Tonight's concert is the St. Peter Claver Gospel Choirfrom 6:00 to 7:00 pm. Celebrate the season at Lafreniere Park (3000 Downs Boulevard) - The annual “Holiday in the Park” The beautiful light display is nightly from dusk 'til 9:45 pm and admission is $3 a car. New displays include a 60' sea serpent in the Lagoon, a Princess and her Castle, and more, in addition, to our traditional favorites - The park comes alive for the holidays with thousands of twinkling lights and displays. And there's more holiday fun at City Park with Celebration in the Oaks! The Celebration runs nightly through January 1st - Sunday thru Thursday from 6:00 pm to 10:00pm and Friday & Saturday 6:00 pm to 11:00 pm (closed Christmas Eve and New Years Eve). There are fabulous new exhibits, nightly entertainment, synthetic ice skating rink, amusement park rides. "Experience and enjoy one of the country's most unique month-long holiday festival of lights!" A beloved holiday tradition - visit www.celebrationintheoaks.com for more info! Need a little art, culture and music? You gotta go to the show at the Ogden Southern Museum of Art (925 Camp St.) - better known as Ogden after Hours. The concert kicks off at 6:00 pm as the Ogden presents THE NEW ORLEANS NIGHTINGALES HOLIDAY CELEBRATION. The New Orleans Nightingales is the brainchild of Ingrid Lucia and is a showcase of the best and brightest female singers New Orleans has to offer. Steeped in the musical traditions of early American jazz, the ladies of the New Orleans Nightingales bring new life to the 100-year-old art form through new compositions, vibrant live performances and a commitment to the idea that traditional jazz music is still evolving! Tonight the O BAR's celebrates the holiday season with The O Martini *Remember with your Ogden membership all of these excellent concerts are FREE!!! And....my hubby Bill deTurk will be doing the interview today - so you definitely don't want to miss it! The Amazing Acro-Cats Meowy Christmas Show Purrrforming Circus Cats! It's a Hard Candy Christmas at MiMi's in the Marigny (2601 Royal). Where all kinds of holiday cheer await at the return of the annual Dolly Parton themed party. Don your finest costumes and compete for prizes from Fifi Mahoney's and Sailor Jerry Rum! 12-2 Deejays Matty and Pasta plus Gal and guest will spin classic records! Happy Hump Day w/a Concert, Art Show, Opera, Kitties and More! Tonight's concert is the Lars Edegran’s Jaxx Band featuring ‘Big Al’ Carson and Lionel Ferbos from 6:00 to 7:00 pm - check out the full schedule below and make plans to hear some great music in a beautiful setting! Tonight is Opera On Tap's Annual Holiday Party at the Four Points Sheraton (541 Bourbon)in the Puccini Bar from 7:00 to 8:30 pm. Join Opera on Tap for their wildly popular Holiday Party at the Four Points Sheraton tonight. They'll be singing some of your favorite opera pieces plus a few local holiday favorites to get you in the mood. So bring your friends and family to the Four Points Sheraton to raise a glass and your voices for our favorite Opera on Tap of the year! Four Points Sheraton has a special valet parking rate of $5 during the concert when you mention you are there for the Opera on Tap event. Have fun in Mid-City over at the Banks Street Bar (4401 Banks)! Tonight it's Wednesday night regular Major Bacon and as always they got some FREE BLTs - tonight at 10:00 pm...you can never get enough of the bacon and no cover!! Triple the fun in Mid-City with a Mid-City Mix-Up with your host Lynn Drury at Dmac's Bar and Grill (542 S. Jefferson Ave.). Lynn hosts a different songwriter/performer - complete with interview and 2 sets of new music each week! Tonight she's havin' fun with Cindy Scott. A Tuesday w/Veggies, Holiday Fun, and Christmas Cheer! Happy Holiday Tuesday - Only one more week 'til Christmas! You can get your day started off right with a trip to the Farmer's Market! Visit the Crescent City's Farmer's Market at University Square (200 Broadway) from 9:00 am to 1:00 pm for the freshest veggies, fruits and seafood. Today for the Green Plate Special they welcome a Mano. Last week was truly delicious with strawberry glazed pork skins, green salad with kumquats and pinenut brittle, marinated shrimp with farro and winter squash, roasted pork sandwiches with provolone and rapini greens, and cannoli with truffle honey and candied pecans - come see what's in store today! Tonight's concert is the Don Vappie from 6:00 to 7:00 pm - check out the full schedule below and make plans to hear some great music in a beautiful setting! It's Christmas time on the Avenue at the The Columns (3811 St. Charles Ave.) tonight! Have a fancy cocktail and enjoy some sing along caroling at 8:00 pm with John Rankin, Ray Moore and Friends Annual Holiday Show! Head on over to Mid-City and to Chickie Wah Wah (2828 Canal)! It must be Christmas time - the trio is back - Osborne, Fohl, Sansone! So finish your shopping and get over to Chickie for a great night of New Orleans original music! There's some fun on Frenchmen tonight too over at d.b.a. (618 Frenchmen) with the The Treme Brass Band at 9:00 pm - there's a $5 cover for the show - but you know you don't want to miss it! Monday Holiday Fun with Lights, Cats and Lots of Music! Tonight's concert is the Harpist Rachel Van Voorhees from 6:00 to 7:00 pm - check out the full schedule below and make plans to hear some great music in a beautiful setting! Chickie Wah Wah (2828 Canal) has an amazing Monday night show with a solo show with Jon Cleary at 8:00 pm! Glen David Andrews + Amanda Shaw will be playing tonight at d.b.a. (618 Frenchmen) - It's going to be a great show - So come on out and say hello, and enjoy the music! Happy Weekend w/Ugly Sweaters, Egg Yolk, Art Markets, Caroling and Christmas Acro-Cats! Enjoy a Night at the Museum! Check out The Where Y'Art? party this evening over at the New Orleans Museum of Art beginning at 5:00 pm and celebrate the weekend! The event is FREE with museum admission. $10 Adults, $8 seniors, students, active military, $6 children ages 17 to 7, children 6 and under are free. Check out the schedule of events below. Tonight is the Awesomely Ugly Holiday Sweater Party at the Hi-Ho Lounge (2239 St. Claude) at 9:00 pm - Daria & The Hip Drops, The Local Skank, and The White Beach Vocal Club are getting together to bring YOU happy holladaze with a show full of singing, skanks, singing skanks, steel drums, silver bells, and SWEATERS! Wear your favorite holiday sweater and get some free Swag! This show starts early! Why? Because not only will we be laying down tunes, we will also be hosting a Holiday Craft Fair/Art Market inside the HiHo! Egg Yolk Jubilee's 4th CD, FRIED, was released Wednesday, & the CD Release Party is tonight, at DBA (618 Frenchmen). Lots of special guests are joining in including Quintron, Rob Cambre and soprano JeAnne Swinley....there will undoubtedly be more. The fun kicks off at 10pm! Come on out for prizes and more! It's gonna be a super-throwdown! Get all your holiday presents at the Piety Street Holiday Market at the Old Ironworks (612 Piety) - Saturday..Piety Street Market decks the halls with their big holiday market! Creative art, handmade jewelry and crafts, homemade goodies, vintage collectibles, flea market finds & great local music with from Frenchmen String Trio and New Orleans Nightingales: Ingrid Lucia & Friends! Caroling in Jackson Square! Join in a truly moving annual tradition as Jackson Square brims with candlelit faces and song-lit spirits as high as the spires of the St. Louis Cathedral. Candles and song sheets provided. Gates open at 6:30 pm and Caroling begins promptly at 7:00 pm. Free and open to the public. And come all ye faithful! Caroling at Palmer Park! Come one Come all - Its Show time - Caroling at Palmer Park at 6:00 pm after the Arts Market. Egg-nog, food and fun with Krewe of Nyx. Celebrate the season and bring non-perishable foods for Food Bank Collection - or just make a donation to the Food Bank. It's the season of singing! 2 big nights of fun at Chickie Wah Wah (2828 Canal) with Honey Island Swamp Band! Friday will be an acoustic performance by the Honey Island String Trio and Alvin Youngblood Hart solo. Saturday will be an all electric night with Alvin Youngblood Hart's Muscle Theory and The Honey Island Swamp Band. Don't miss these two nights of great music! Palmer Park corner of S. Carrollton and S. Claiborne Avenues. Still working on some last minute Holiday Shopping? Then you've saved the best for last! Join us this weekend for the 2 day Arts Market of New Orleans. From stocking stuffers, to awe inspiring original gifts, there's nothing you won't find from our local and regional Fine Artists & Craftspeople. We'll have different artists each day, and don't forget all the fabulous food, live music and activities for kids. 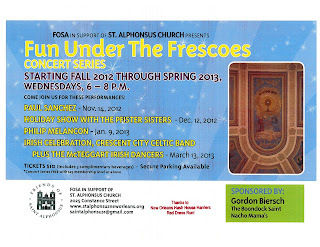 Happy 12/12/12 - Fun Under the Frescoes Holiday Show w/the Pfister Sisters at St. Alphonsus Church! Happy Holidays and Happy 12/12/12!!! Tonight - Tonight!!! The Friends of Saint Alphonsus host this season’s second Fun Under the Frescoes concert at St. Alphonsus Church (2025 Constance St.) in the Irish Channel with the pfabulous Pfister Sisters for an evening of harmony and holiday cheer from 6:00 to 8:00 pm! One-of-a-kind New Orleans troubadour Philip Melancon brings unparalleled wit and talent to our January 9th “phil”harmonic. Happy Holiday Tuesday w/Veggies, Cocktails for Pets, and Christmas Fun! You can get your day started off right with a trip to the Farmer's Market! Visit the Crescent City's Farmer's Market at University Square (200 Broadway) from 9:00 am to 1:00 pm for the freshest veggies, fruits and seafood. Today for the Green Plate Special they welcome Amano. This week they'll have strawberry glazed pork skins, green salad with kumquats and pinenut brittle, marinated shrimp with farro and winter squash, roasted pork sandwiches with provolone and rapini greens, and cannoli with truffle honey and candied pecans. Come grab a plate! Dijon (1379 Annunciation St.) continues its Celebrity Bartender Bash benefiting the LA SPCA tonight from 5:30-7:30 pm - featuring social divas Margarita Bergen, society blogger and columnist for New Orleans Living Magazine and Sheri M. Bleuler McKee, NOLA's Party Girl with NewOrleansLocal.com. All bartender tips during happy hour will be donated to the LASPCA, as well as a portion of all food sales from the evening. Guests will enjoy wine and cocktail specials and complimentary light hors d'oeuvres. Fun!! Tonight's concert is the Pfister Sisters from 6:00 to 7:00 pm - check out the full schedule below and make plans to hear some great music in a beautiful setting! Happy Monday w/Holiday Fun, a Movie and Lots of Music! The NOLA Japanese Cinema Series at Cafe Istanbul (2372 St. Claude Avenue) continues with tonight's film at 6:00 pm - Sprited Away - In the middle of her family's move to the suburbs, a sullen 10-year-old girl wanders into a world ruled by gods, witches, and monsters; where humans are changed into animals; and a bathhouse for these creatures. Glen David Andrews is back for his regular Monday night gig at d.b.a. (618 Frenchmen) - So come on out and say hello, and enjoy the music! Weekend Fun w/a First and Fresh Fridays, Cocktails for Dogs, Christmas Fun, Markets and Holiday on the Boulevard! Don't miss the First Friday on Fulton Street (right around the corner from Harrah's) tonight from 5:00 to 8:00 p.m. The special festive evening includes a special sampling selection from the Abita Beer Christmas Ale tap in the Manning’s Courtyard, along with featured guest Archie Manning!! Grand Isle will be serving up shrimp & grits with andouille gravy alongside other tastings from Fulton Street neighbors including - Ruth’s Chris, Manning’s, Gordon Biersch and Besh Steakhouse!! All this yummy fun is just $20.00 per person and includes a featured glass of wine. There's also going to be entertainment from The Hot 8 Brass Band! *Be sure to stop in at Grand Isle for their holiday happy hour from 4:00 to 7:00 pm and check out their brand new festive drinks tonight and all season long: Under the Mistletoe Martini, Hot Apple Cider and Peppermint Martini - Ho! Ho! Ho! Come let the dogs out at Spun Crossroad's Fresh Friday! Experience fresh, local, seasonal produce under the backdrop of fresh, local specialized art, all while helping out a local non-profit! Tonight it's Think DOG, it's Friday! A FREE event at the New Orleans Healing Center (2372 St. Claude Ave.) from 7:00 to 10 pm. There's going to be libations created by Yolanda Butler, mixologist extraordinaire with a "Battle of the cockTAILs", cast your ballot by seleting from two fresh delicious drinks that will have your tail wagging! There will also be cooking demos by Fatoush! Proceeds from all the fun will go to Dag's House!! - 7 to 9 pm: Come sit on Santa's lap and get a wee hug from Mrs Claus. You'll get something whether you've been naughty or nice. - 7 to 9 pm: Help the IRISH NETWORK NEW ORLEANS and THE FRENCH AMERICAN CHAMBER OF COMMERCE at their meet and greet. Bring an unwrapped gift for "TOYS FOR TOT'S" or a pair of kiddies pajamas and book for THE PAJAMA PROJECT"
It's Toys for Tots at the Irish House (1432 St. Charles) all day long! There's a toy drive all day long, and anyone who brings a toy gets the military and service discount. Tonight Comedy Fusion will also be a part of the Toy Drive. The comedy show features RedBean, James Cusimano, Jonah Bascle and J.D. Sledge - Admission is $15 at the door or $5 with an unwrapped donation of a toy! And you don't want to miss Freretstivus!! A true holiday celebration on Freret and Napoleon from Noon to 5:00 pm....There's gonna be a 90 local vendors, selling food, art, jewelry, and collectibles. Please shop locally for the holiday season. *The Airing of Grievances. Win a prize if your grievance is selected! *Feats of Strength. Tug of war with the Big Easy Roller Girls. *Freretstivus Pole. Unadorned, of course. *Regifting Booth. Give one. Take one. *FREE live music by with - 3 Piece Spicy at Noon - ChaWa at 1:45 - Parishoners at 3:30...Don't miss out on the fun!! A Thursday at the "O", Toasts & Tails, Launch Party and Great Music! Don't miss out on the weekly wine tasting at Cork and Bottle (3700 Orleans ) about 5:00 pm in Mid-City - Taste some amazing wines. Come sip, shop and purchase your favorite wine for 10% off! You can also head on over to Clever (right next door) for a great cocktail after attending the free wine tasting. And be sure to stop by the Crescent City Farmer's Market (in the parking lot) and patronize local Louisiana vendors with fresh veggies, seafood and more! Need a little art, culture and music? You gotta go to the show at the Ogden Southern Museum of Art (925 Camp St.) - better known as Ogden after Hours. The concert kicks off at 6:00 pm as the Ogden presents Kenny Brown. Kenny Brown grew up in the hill country of northern Mississippi and knows the region's music well. As a 10-year-old, he learned to play guitar from his neighbor Joe Callicott, and has played with Mississippi Blues Masters ever since! Tonight the O BAR's celebrates holiday season with the O Martini! *Remember with your Ogden membership all of these excellent concerts are FREE!!! Cocktails for Pups and Kitties! Tonight it's Toasts & Tails and Jingle Bells at the NO Fleas Market (4228 Magazine St.) tonight from 6:00 pm – 8:00 pm. Enjoy 10% off all merchandise, light hors d’oeuvres, treats for pooches (hey..what about the kitties? ), pet photos with Santa, door prizes, a NO Fleas Market Fashion Show by FashionWeek New Orleans www.fashionweeknola.com, and a Howliday Costume Contest!! Don't miss out on all the fun - $5.00 donations help out The Louisiana SPCA. Friendly, leashed pets are welcome!! Come out and get inspired at the dcoy Launch Party this tonight at 8:00 pm – when modern cocktails meet vintage fabrics at Bellocq in The Hotel Modern (936 St. Charles) on Lee’s Circle. dcoy will have their product lines on display, a specially designed coaster to take home, and to top it off a seasonal cocktail created just for this special event! Check out the story on AskMissA too! There's lots of fun going on over at Chickie Wah Wah (2828 Canal) tonight! Come on over for the fabulous Kenny Neal at 8:00 pm and stay on for some more excellent music with Kirk Joseph's Backyard Groove! Happy Wednesday with Holiday Sounds, Book Signings and Lots of Music! Tonight's concert is the Philip Manuel & Shades of Praise from 6:00 to 7:00 pm - check out the full schedule below and make plans to hear some great music in a beautiful setting! Come by Café Degas (3127 Esplanade) for some delicious hors-d'oeuvres and a signed copy of the Café Degas Cookbook from 5:30 pm to 7:00 pm. Purchase $100 or more of Café Degas Gift Cards, and receive one free Cookbook! Authors Rene Brunet and Jack Stewart will discuss from and sign copies of their book, There's One in Your Neighborhood - The Lost Movie Theaters of New Orleans, tonight at 7:00 p.m. at the East Bank Regional Library (4747 West Napoleon Avenue, Metairie). The event is free of charge and is open to the public. The book presents the history of more than 100 neighborhood theaters. Since 1896 when the nation's first movie house, VitaScope Hall, opened on Canal Street, nearly 200 neighborhood theaters have come and gone. Have fun in Mid-City when you head on over to Chickie Wah Wah (2828 Canal) for some happy hour drinks and stay on for Meschiya Lake and Tom McDermott at 8:00 pm - it's a great evening of music! And more fun in Mid-City over at the Banks Street Bar (4401 Banks)! Tonight it's Wednesday night regular Major Bacon and as always they got some FREE BLTs - tonight at 10:00 pm...you can never get enough of the bacon and no cover!! Triple the fun in Mid-City with a Mid-City Mix-Up with your host Lynn Drury at Dmac's Bar and Grill (542 S. Jefferson Ave.). Lynn hosts a different songwriter/performer - complete with interview and 2 sets of new music each week! Tonight Keith Bernstein of the Mumbles is on keyboard. He's got that Nola piano sound and some funky tunes! Looking for some dinner and then some music for dessert? Rock 'N Bowl (3016 S. Carrollton) can help you out! Get an entree' over at Ye Olde College Inn and then get a half price ticket to the show right next door at Rock N' Bowl....Tonight - it's the swingin' sounds of Jerry Embree at 8:30 pm!! A Tuesday w/Veggies, Art and Beer, plus Holiday Fun! You can get your day started off right with a trip to the Farmer's Market! Visit the Crescent City's Farmer's Market at University Square (200 Broadway) from 9:00 am to 1:00 pm for the freshest veggies, fruits and seafood. Today for the Green Plate Special they welcome Amano. This week they'll have marinated beets with toasted pecans and local citrus, cavatelli with roasted carrots, carrot green pesto and Pecorino, goat and pork sausage with winter squash and an agrodolce sauce, and a dessert of rosemary panna cotta with satsuma marmalade. Come grab a plate! Stop by the Crescent City Brewhouse (527 Decatur) between 5:00 and 7:00 pm for a an art show reception featuring some of New Orleans' finest artists - Michael Fedor, Mina Bellavia, Pati D'Amico, Owen Murphy, Natasha Sanchez, Steve Soltis, Mara Marich Tardy & William Warren. Complimentary beer and soft drinks will be served along with some light hors d'oeuvres. And to top off the fun it's the monthly Beer Tapping party featuring their newest special brew - Dunkel Weiss! Come by to enjoy the new artwork in the restaurant as well as some freshly brewed beers. Tonight's concert is the Opera Creole from 6:00 to 7:00 pm - check out the full schedule below and make plans to hear some great music in a beautiful setting! Happy Monday with Chorus Girls and Good Music! Weekend Fun with Art, A Fur Ball, Draw-A-Thon, Comic Con & Irish Dancing! Enjoy a Night at the Museum! Check out The Where Y'Art? party this evening over at the New Orleans Museum of Art beginning at 5:00 pm and celebrate the weekend! The event is FREE with museum admission. $10 Adults, $8 seniors, students, active military, $6 children ages 17 to 7, children 6 and under are free. Celebrate LIFELIKE, NOMA encourages guests for Where Y’Art?! on this night to come out for Feaux Real Night! Come out dressed in your finest feaux furs, costume jewelry, and mock-brand attire for half off admission! Check out the schedule of events below. TONIGHT IS THE NIGHT - Fur Ball a Benefit for Animal Helper New Orleans the FUN is from 6-10 p.m. at The Cannery (3803 Toulouse, New Orleans). No special attire needed, come as you, and please bring your family and friends. They’ll have the Pussyfooters, Rollin Elvi, and the MC is Tami Tarmac. There will be a DJ, 50/50 raffle, awesome door prizes and delicious FREE food. There will also be a cash/credit bar and a photobooth provided by Boogie Booth. Please come, there are many bargains to be had, with all proceeds going to a great cause. Thank you for all your support and we really hope to see you there!! It's DRAW-A-THON 2012 - 24 Hours of Drawing Fun! The drawing begins Saturday at 6:30 am and continues on through Sunday at 6:30 am at The Marginy Opera House (725 St.Ferdinand Street). Draw-a-thon is probably the only event of its kind in the city of New Orleans—a FREE, all ages marathon drawing experience with all art materials provided. The 24 hour event is punctuated by two hour drawing workshops developed by local artists and arts educators designed to encourage the participant to fully experience and study the art of drawing. The event’s environment is constantly changing, illuminated by what is being taught and drawn. There will be on-going activities as well as structured events. You can choose your own adventure within the effervescent creative experience by hopping between workshops lead by local artists such as Kenny Harrison, Courtney Eagan, James Goedert, Natalie McLaurin, Caesar Meadows, Gary Oaks, Brad Benischek, Bob Snead and many others. On-going activities include the infamous Amazing Draw-a-tron 3000, Get Well Cards for Hubig Pies, Whimsy Post, Draw Your Fortune, Dream Drawings, Drawing Receptacles and much more! Saturday evening check out some amazing art at local galleries around town. These two are going to be especially wonderful! Sibley Gallery (3427 Magazine) - Memes amd Mirrors of Mind and Memories - 6:00 to 9:00 pm - Jimmy Block makes use of form and shape, light and shadow, in constructing pieces which reflect recurring memories and cultural and artistic ideas influenced by geometry and mechanical structures. The two dimensional plane is expanded using negative (dark) space and luminosity invoked by means of positive (light) space. Reflections and refractions of light from the materials utilized complement and complete the piece and invite the viewer to multiply the themes and memories from his own experience and imagination. Jean Bragg Gallery (600 Julia St.) - IcoNOLAgy by Will Smith from 6:00 to 9:00 pm. Amazing artwork of local New Orleans icons - and yes, there may even be a surprise visit from the one and only Chris Owens!! The Friends of St. Alphonsus host the Annual International Creche Exhibit for one week only, December 2nd through 9th, at St. Alphonsus Church in the Irish Channel. The exhibit features creches, better known as mangers from around the world. The variety ranges from a crib made from a walnut from the Pacific Islands to grand Lalique figures. Monday through Friday from 10:00 am to 2:00 pm. *The exhibit will close Sunday, December 9th with Christmas caroling from the Laetare Singers from St. Dominic. For more information, call (504) 524-8116.